NATURAL HABITAT AND PREFERRED SITE: Lacebark elm is native to China but has adapted well to various soils except those where cotton root rot is a problem. IDENTIFICATION INFORMATION: Lacebark elm is a medium size tree with an overall rounded or oval crown. Generally does not have a central leader. It has small typical elm leaves, weak at best fall color, limber stems, and distinctively mottled trunk bark. FLOWERS AND FRUIT: Flowers are not showy and born in clusters in October. Fruit forms in clusters among the leaves in the fall usually October through November. Fruit is green when young, maroon when seeds are exposed to full sun and are somewhat showy. BARK: Smooth when young, reddish tan color with age that develops a general flakiness. 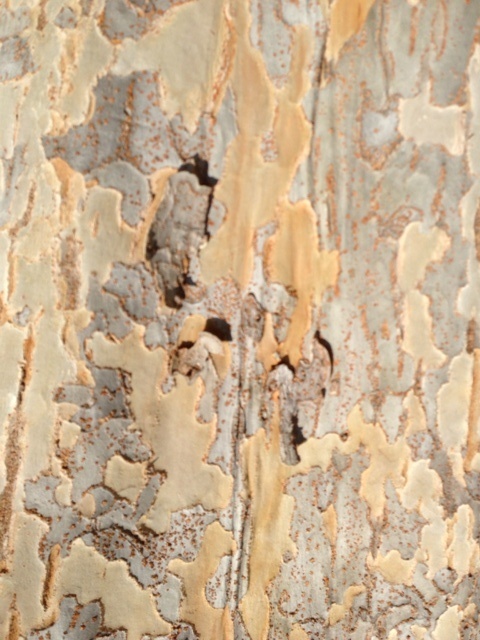 The inner bark, under peeling bark is salmon in color. The bark is the most interesting feature on the tree. FOLIAGE: Leaves are alternate, simple and ovate about 1 to 1-1/2 inches long with sawtooth margins, tapering to a point at the tip and like most elms the leaves are rather lopsided at the base. The leaves are medium to dark green above and lighter beneath and generally have weak yellow fall color. CULTURE: Lacebark elm is a very fast growing upright to spreading and even drooping tree. It has delicate foliage for an elm. In the past I have said this tree is extremely easy to grow, which it is, except for one fatal flaw. It is susceptible to cotton root rot and should not be planted in the black soils where cotton crops have grown in the past. The Sick Tree Treatment can prevent this problem in most cases but not all. It is cold and wind tolerant and relatively drought tolerant tree and requires only moderate fertilization. Can tolerate extremely poor soils and restricted root growth areas and even soil compaction. It is also resistant to the elm diseases and typical elm insect pests. PROBLEMS: Although highly resistant to Dutch elm disease Lacebark elm is susceptible to minor elm leaf beetle attack and is very susceptible to cotton root rot. PROPAGATION: Can be grown easily from seed, softwood cuttings or cuttings taken in late winter just prior to spring bud break. INSIGHT: Lacebark elm is often confused with Siberian elm – Ulmus pumila which is incorrectly called Chinese elm. Siberian elm is devastated every year by the elm leaf beetle. It is one of the few trees I recommend removing if exists on site and certainly never consider planting one. Siberian elm is one of the poorest tree choices. It has larger leaves, more deeply furrowed bark and does not develop a flaky pattern on the trunk. Also it flowers and fruits in the spring rather than the fall. Only cedar elm and lacebark elm produce fruit that matures in the fall. QUESTION: A year ago, we planted a lacebark elm by following your planting instructions: cut the circling roots, expose the tree’s root flare and add mulch. The tree was doing well until recently, when we noticed some of the branches drying and dying. St. Augustine grass runners were extending from the lawn into the root flare area, and my husband has been cutting them with a heavy-duty electric weed trimmer. Yesterday, I inspected the root flare, and it seems that my husband recently cut all the way through two of the tree’s small roots and then scalped the largest root and the base of the tree with the weed trimmer. Can we do anything to save the tree? ANSWER: Cover the wounds with my Tree Goop, a paste that you can make. Applying burlap soaked in the same paste (but with more water added) will help keep the area moist as it heals.